The Second World War saw Halifax and Nova Scotia on the very front lines of the Battle of the Atlantic. At this time British, American and Canadian film crews were all active in the city along with a string of Hollywood celebrities, like Warner Brothers Star Ronald Reagan, the B-movie actor who would eventually become President of the United States, passing through to make the dangerous crossing to Europe. Four sets of world-class filmmakers shot or set their films in Halifax, often venturing out to sea in search of German U-Boat submarines. The Archers, the British Team of director Michael Powell and writer/ producer Emeric Pressburger, set a substantial portion of their epic film 49th Parallel on the East Coast, with a key scene shot in Halifax’s famed War Room at Barrington and South Streets. The film follows the small surviving unit of a U-Boat crew as it wanders across Canada, encountering various ethnic groups including Laurence Olivier as a flannel-shirted French-Canadian. The climax of the story takes place in the Rockies with Leslie Howard, and is surprisingly moving. 49th Parallel’s editor was none other than David Lean, who would go on to become one of the greatest filmmakers of all time, responsible for such classics as Lawrence of Arabia and A Passage to India. Dutch Documentarian Joris Ivens was hired by the newly fashioned National Film Board of Canad, which came into being May 1, 1939, to make a fly-on-the-wall non- fiction portrait of the Battle of the Atlantic which was eventually titled Action Stations. The 45-minute film was shot in extraordinarily difficult conditions, with winter ice layering the anti- submarine Corvette ships. Iven’s footage became the source of a great deal of Battle of the Atlantic footage, even if the ‘sinking of the U-Boat’ sequence was actually staged with a captured vessel. Iven’s amazing reputation – he made ‘Spanish Earth’ during the Spanish Civil War with Ernest Hemmingway, chronicled the closing of the Zuiderzee in his native Netherlands and filmed communist China and Vietnam, has earned him an institute bearing his name in Holland where his cinematic works are studied and celebrated. Legendary American writer, producer and director Howard Hawks filmed a feature drama on the same subject in Halifax at practically the same time. Entitled Corvette K-225, it starred Randolph Scott as an interior decorator from Vancouver who captains a corvette. Character actor Andy Devine is part of the crew, and interestingly enough this film from Hollywood’s Universal Studios portrayed the Canadian Navy in action, as opposed to US fighters. One memorable scene sees cadets marching around the Dalhousie Quad. Not to be outdone, Warner Brothers supplied perhaps the biggest star to ‘appear’ in Halifax. In the Warner Brothers follow- up to the landmark 1941 film noir the Maltese Falcon, Humphrey Bogart– along with his co- stars from the previous flick Mary Astor and Sidney Greenstreet– spend the first twenty minutes or so of the wartime thriller entitled Across the Pacific in Halifax as they depart for the Panama Canal. Bogie saves the day, practically single-handedly, of course. This was maverick writer, director, actor John Huston’s last film before he himself joined the US Forces Film Service, and while they didn’t shoot in Halifax, the city plays a crucial part in the storyline. Why a Halifax marching band even toots past as Bogie attempts to join the Canadian Artillery Corps. 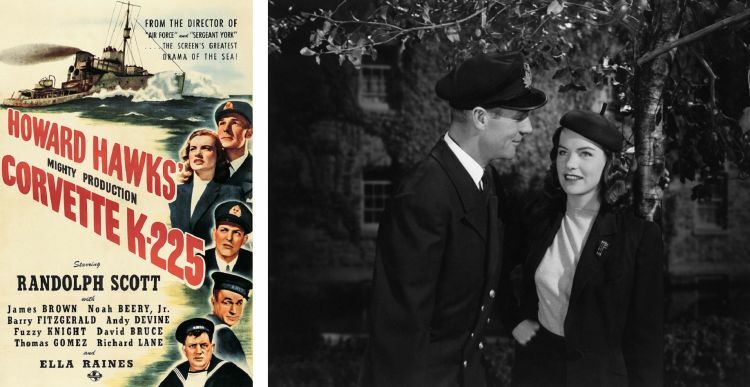 The many reference to Nova Scotia in Hollywood films during and after the war might just have been generated by all this cinematic attention. Years after the World War Two in the late 1980s and early 1990s, the daughter of Emeric Pressburger – Angela Gwynn John – moved to Halifax as part of the growing Buddhist community. A filmmaker herself, her two sons, Andrew and Kevin Macdonald, helped out during the early days of the Atlantic Film Festival where Gwynn-John was a programmer. Today, of course, Andrew and Kevin Macdonald make up much of the Scottish and British feature film scene, with titles such as Shallow Grave, Trainspotting, 28 Days Later and The Last King of Scotland to their credit. The 1940s proved to be one of the busiest periods of the East Coast Film History, with ramifications that would linger on down the years. Back then, however, the front line was indeed on our doorstep, confirming Halifax’s geographic reality as a truly international city. The impact of this fact on motion pictures coming from Nova Scotia in the rest of the century and beyond would be profound.